Using old school maps we walk along the metro line in Matosinhos until we need to go away from it to find our hostel for the next two nights. (Actually, Randy and Joan read maps and I just follow.) We manage to wind around neighborhoods, a large hospital, and cross crazy traffic until Randy spies a tiny sign in front of the building – Oportocean Hostel. A metro line stop is practically in our back yard, so off we go to the old section of Porto, to take advantage of a free Porto Walking Tour advertised. Look for the orange umbrella for a tour in English. The tour guide is fabulous, taking us all around the old city centre, along the Douro River, while pointing out interesting landmarks and sharing a tremendous amount of history for two full hours. This young lady will do very well in life and we make sure to tip her accordingly. Shame on people that ditch a tour when it is almost over to avoid tipping. Rant over. I don’t know where I’m going from here, but I know it won’t be boring. A pilgrim walks through the cooler air of a tunnel on a hot day along the Camino de Santiago. Impressionistic effect created using Topaz Studio. I find myself mesmerized by the process as each step is carefully, yet quickly, completed. Noticing the bare hands, I wonder how many burns occur during a typical work week. I know I would need a first aid kit within close proximity. 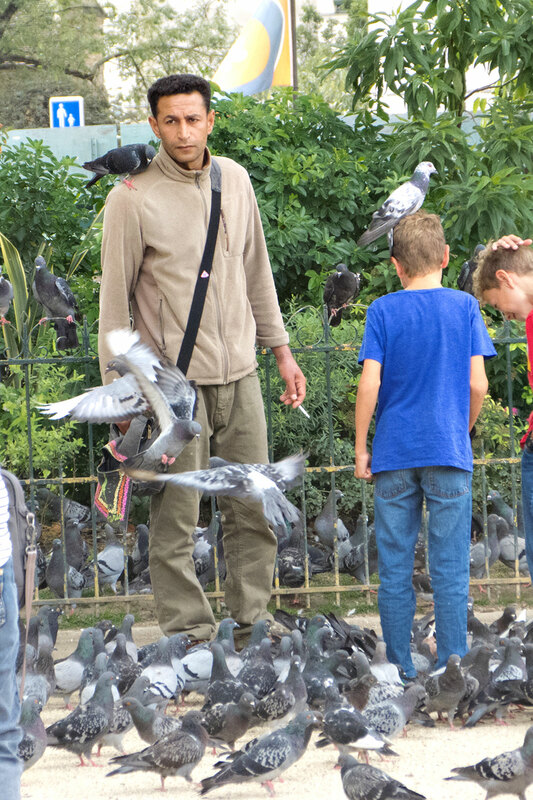 People of Paris #12 features Pigeon Man, also known as the Pigeon Whisperer. It appears as though the gentleman is not thrilled with his role in life and may be thinking that this is one crappy job. Located in the Notre Dame Cathedral square, there is some history behind this practice. 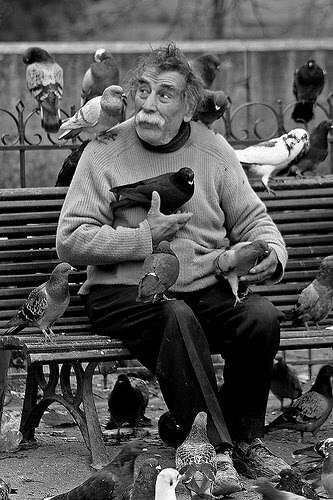 The original Pigeon Man of Notre Dame, Pierre Pradeau came almost every day after his retirement to feed the birds, until he passed away on December 13th, 2009. It’s all in the attitude, right?